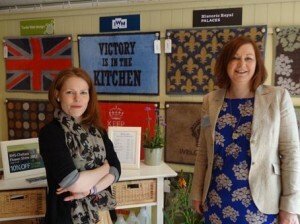 Tales from the Potting Shed - RHS Chelsea 2012 - The Turtle Mat Blog - For news, features and competitions! The Turtle Mat Blog – For news, features and competitions! Rebecca Wilson on the subject of In The Garden,RHS Chelsea Flower Show 2012. Posted on June 6th, 2012. A sunny, busy week away from Turtle Towers as the team headed to the RHS Chelsea Flower Show 2012. Exhibiting Turtle Mats directly for the first time was an exciting if daunting prospect but after much hardwork, care and attention the stand finally took shape late on Sunday evening with a display focusing on the new RHS Turtle Mat design ‘Heritage Peony’. We were lucky enough to have bagged some beautiful peonies from Binny Plants to display with the mat. This Scottish nursery specialising in some stunning peonies really did come to our rescue – thanks Adam! After a good night’s rest we were set for the opening of the show and the press and Queen’s visit. Much of the day was spent celebrity spotting, with our intrepid photographer Kate taking a few shots of those enjoying the first glimpse of the show. A thoroughly enjoyable start to the week as one customer commented that they had never thought they should have measured their doorway before attending the gala evening! Tuesday morning brought the judges verdict, and after fleeing from the stand with nerves on Monday whilst judging took place, we were then pleased as punch to be awarded a commendation from the RHS for the quality of our stand. Cue many smiles and a celebratory glass of Pimms! The sun decided to make a belated appearance on Tuesday afternoon as RHS members flocked to the show but it didn’t dampen visitors’ enthusiasm for doormats knowing how fickle the British weather can be. 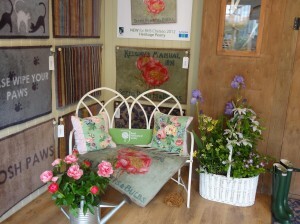 ‘Heritage Peony’ proved a real winner as did our range of Cape Cod outdoor mats. The week continued in the same very sunny, very busy way! With weary legs, suntanned faces and lots of lovely comments from customers old and new we headed back to the Cotswolds. Thank you to everyone who visited us at the show and to our lovely show neighbours Scotts of Thrapston and sculptors Brendon and David for making our first time at RHS Chelsea such a great experience. Don’t forget the special show offer runs until the end of June, so don’t miss out! Also, a special mention to the local suppliers from whom we sourced the beautiful Clematis – Walled Garden Nursery, Brinkworth and the glamorous irises – Malmesbury Garden Centre. 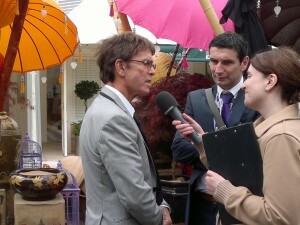 This entry was posted on Wednesday, June 6th, 2012 at 8:38 am; on the subject of In The Garden, RHS Chelsea Flower Show 2012.